(Newser) – Park rangers furloughed during the 35-day government shutdown are back to work at Joshua Tree National Park with plenty of damage to repair. With a sharply reduced crew at work during the shutdown, "a few vandals or people acting out of ignorance" took vehicles off road, knocked over gates and posts, and left garbage scattered, John Lauretig of the nonprofit Friends of Joshua Tree tells the New York Times. There's not much humans can do about the worst damage, however. A small number of the park's spiky-leafed Joshua trees appear to have been cut down or driven over, and it could take centuries for them to regrow to maturity. "What's happened to our park ... is irreparable for the next 200 to 300 years," former park superintendent Curt Sauer says, per the Palm Springs Desert Sun. Only selfish, psycho morons would do this kind of irreparable destruction BUT it has nothing to do w/ the shutdown. It couldve happened when the rangers were on duty. 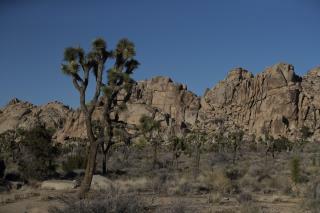 Joshua Tree is 1,235 sq miles (Delaware is 1,981 sq miles). National parks are enormous...not one has enough staff to know whats happening in all corners of it at any give time. This is a very weak straw man argument. A crime of wanton douchery. This is just pandering to people who feed off of hatred and outrage and need someone or something to be pissed off at. This is irresponsible journalism. At least it's making the most vile and disgusting people in our society identify themselves through their fake outrage and ill intentions.